 How to spot fake Rolex plus Video | iSpotFake. Do you? ENGRAVED CASEBACKS… In addition to the “clear casebacks” listed above, engraved casebacks are another easy way to identify counterfeit Rolex watches. 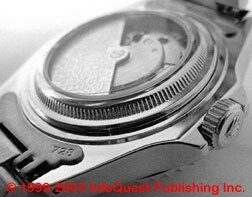 Again, Rolex does not engrave the caseback with logos, hallmarks, or designs (as shown in the example above). Genuine Rolex models will have a “smooth” caseback, and are free of these engravings.The rare exceptions to this are ladies’ models (prior to the mid 1990’s) which had “Original Rolex Design” or a similar variation thereof, engraved on the caseback in an arc fashion. Another exception is on the Sea-Dweller case backs which will have “ROLEX OYSTER ORIGINAL GAS ESCAPE VALVE” engraved around the outside of the caseback in an arc fashion. Counterfeit Rolex models with "engraved casebacks". Left: Counterfeit Submariner with engraved hallmarks & logos. Right: Counterfeit Daytona with engraved "Winner Rolex 24". HOLOGRAM STICKERS… Genuine Rolex models are shipped new from the factory with a Hologram-encoded (3-dimensional) sticker on the caseback. This sticker features the trademarked Rolex “crown” positioned above the watch’s case reference number. 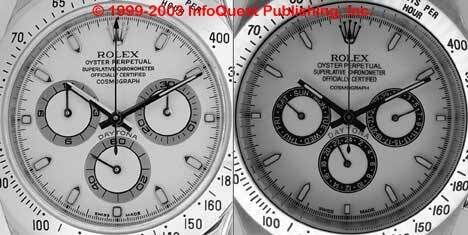 The hologram can be easily identified by viewing it from different angles, thus causing the background pattern to change.However, “most” counterfeit stickers are not holograms at all, but rather simply a repetitious “Rolex” pattern which does not change in appearance when viewed from different angles. It is worth mentioning that the genuine Rolex hologram stickers did not feature the “crown logo” as a part of the hologram until (around) 2002, when the sticker was redesigned. At that time, the Reference number was also changed from gold lettering to black, as it is currently. Comparison of genuine and counterfiet "hologram stickers". Left: Genuine Rolex hologram-encoded 3-dimensional sticker. Right: Counterfeit fabricated hologram sticker. DATE MAGNIFICATION… For authentic Rolexes, the crystal (on all current date models–excluding the Sea-Dweller) will have a glass bubble, or “cyclops” attached to the crystal, positioned over the date. Its purpose is to magnify the tiny aperture and does so at 2.5 times magnification.However, on MOST counterfiet models the date magnification is more like 1.5 times, at best (as shown in the example above). This may not sound like much of a difference, but when looking at the dates side-by-side it’s obvious. The date window should practically “fill up” the cyclops–the fakes don’t even come close. It is worth mentioning that some counterfeits are now featuring a new larger font date wheel to give the “illusion” of being magnified at a full 2.5 times. Comparison of a genuine and counterfiet "date magnification". Left: Genuine Rolex Submariner with proper (2.5 times) date magnification. Right: Counterfiet Rolex Submariner with much smaller date magnification. TRIPLOCK CROWN SEAL… Rolex models featuring the Triplock crown (i.e. Submariner, Sea-Dweller and Daytona) utilize an extra seal within the threads of the winding crown’s tube. This gasket resembles a black o-ring and can be visible when the winding crown is unscrewed fully. As shown in the example above, (most) counterfeit models will not feature this o-ring seal, but rather will have basic screw-down threads. 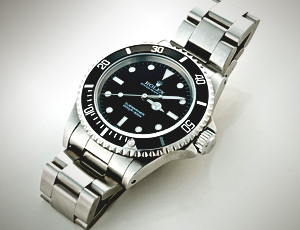 It is worth mentioning that some new counterfeits will feature a “similar” looking rubber seal, but upon closer examination you will see that it is merely cosmetic, and is not functional.As shown in the image below, the Triplock crown can be identified by 3 tiny dots positioned under the trademarked Rolex “crown” logo, which is engraved on the end on the winding crown. Comparison of a genuine and counterfeit "Triplock crown seal". Left: Genuine Rolex Submariner Triplock crown with rubber o-ring seal. Right: Counterfeit Rolex Submariner basic crown without seal. YACHT-MASTER “MINUTE” HAND… Genuine Rolex Yacht-Master models feature a “minute” hand which is considerably thicker than those on other Rolex sports models. However, to save money, counterfeiters will often use the same hands found on the Submariner. This can be easily identified when viewed side-by-side (as shown in the example below). Comparison of a genuine and counterfeit "Yacht-Master minute hand". Left: Genuine Rolex Yacht-Master featuring oversized "minute" hand. Right: Counterfeit Rolex Yacht-Master featuring standard sized "minute" hand. DAYTONA HANDS… Counterfeiters will often use hands which are of the wrong size and/or shape. In the example shown above, the genuine Daytona features a “minute” hand which reaches all the way to the outer “hash” marks. However, the counterfeit model shown features much shorter hands. This is often the case because counterfeiters use whatever stock of parts they have available, which is usually whatever is the cheapest.You will also note that the “shape” of the hands on the counterfeit is incorrect. modern Daytona models feature hands which are “rounded” on the tips. Again, counterfeiters will often use whatever hands they have available, and in this case they have used hands from a Day-Date model, which are flat on the tip. Comparison of genuine and counterfeit "Daytona hands". Left: Genuine Rolex Daytona featuring full-sized "shaped" hands. Right: Counterfeit Rolex Daytona featuring under-sized, "flat tip" hands. DAYTONA REGISTERS… Genuine Rolex Daytona models feature mini-registers on the dial which perform Chronograph “stop watch” functions (i.e. elapsed hours and minutes). It is also worth mentioning that the large “sweep” hand on the dial is also part of the stop watch function, and is not the primary second hand– the second hand for the watch is the small 20/40/60 register.However, counterfeit models will rarely perform these functions, but rather will be used for “day of week”, “date”, and “24-hour time”. (Please Note: not all counterfeit models will be “printed” with these incorrect functions, but their operations will still be incorrect. )Furthermore, the size and position of these mini registers will often be incorrect on counterfeits. As shown in the example above, the counterfeit model features much smaller registers which are positioned too far inward on the dial, while the genuine Daytona features registers which are positioned much farther outward–almost touching the 3-6-9 hour markers. omparison of genuine and counterfeit "Daytona registers". Left: Genuine Daytona featuring properly marked and positioned registers. Right: Counterfeit Daytona featuring smaller and incorrectly marked registers. Identification of the GENUINE "micro-etched crystal". Above: A close-up view of the etching on a genuine Rolex Explorer. 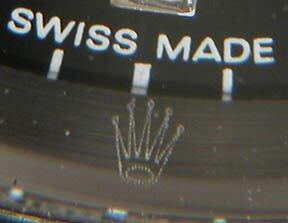 Below (left): The etching as it appears on the crystal of a counterfeit Rolex Submariner. HINT: It's just barely visible below the "SWISS MADE" on the dial. Below (right): A close-up view of the same etching..
You will notice that the fake etching is "similar" to that in the genuine example, the biggest difference being that the "balls" on the tips of the fake are too small. CASE REFERENCE NUMBERS… Probably the most accurate way to identify a genuine/counterfeit Rolex watch is by locating the Serial and Case Reference Numbers. These special identification numbers are engraved on the side of the case, located between the lugs (as shown in the example above).As you can see in the examples above, the engraving between the lugs of a genuine Rolex feature very fine lines, which actually catch the light similar to that of a diamond cut edge. However, (some) counterfeits will feature a sandy (acid) etched appearance, as seen in the example above. Furthermore, the spacing on these numbers is often too close together. 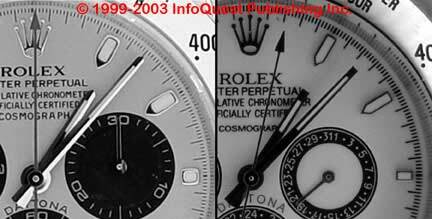 It is worth mentioning that counterfeiters frequently use the SAME numbers on their watches. Thus, the example shown above: “R863698” is seen quite often, and is a pretty good sign of a fake. Identification of Rolex "case reference numbers" Above: The engraving (between the lugs) of a GENUINE Rolex Submariner. 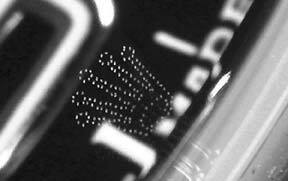 Below: The "acid etching" (between the lugs) of a FAKE Rolex Submariner.